Varouj Aivazian is a Professor and Chair of the Economics Department at University of Toronto Mississauga, with a cross-appointment to the Business Economics area at Rotman. 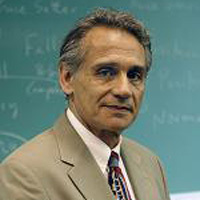 He has published many scholarly articles in Finance, Law & Economics, and Economic Theory in leading international academic journals. He served on the Governing Council of the University of Toronto (2006-2011), was a member and Chair of the Social Sciences Review Panel of The Connaught Committee (1992-1995), and served as Director of the Master of Financial Economics program (2002-2011). “Experimental Tests of Core Theory and the Coase Theorem: Inefficiency and Cycling”, Journal of Law and Economics, November 2009, with J. Callen and S. McCracken. “Financial Constraints and Investment: Assessing the Impact of a World Bank Credit Program on Small and Medium Enterprises in Sri Lanka”, Canadian Journal of Economics, May 2008, with Eric Santor. “Dividend Policy and the Role of Contracting Environments”, FSR Forum, December 2005, 13-20, with L. Booth and S. Cleary. "Why Some Firms Smooth their Dividends and Others Do Not", Journal of Financial and Quantitative Analysis, June 2006, with L. Booth and S. Cleary. “Debt Maturity Structure and Firm Investment”, Financial Management, Winter 2005, 107- 119, with Y. Ge and J. Qiu. “Can Corporatization Improve the Performance of State-Owned Enterprises even without Privatization?”, Journal of Corporate Finance, October 2005, 791-808, with Y. Ge and J. Qiu. “The impact of Leverage on Firm Investment: Canadian Evidence”, Journal of Corporate Finance with J.Qiu and Y. Ge, March 2005. Discussion of “Does Diversification Improve Bank Efficiency?”, in the proceedings of a conference held by the Bank of Canada, The Evolving Financial System and Public Policy, Dec. 2004, 128-131, Bank of Canada. "A Note on the Economics of Exhaustible Resourses", with Jeffrey L. Callen, Canadian Journal of Economics, 1979, 83–89.